About 65 jobs are set to be created at a factory which makes fireproof materials used in cladding after permission to expand in the wake of the Grenfell Tower tragedy was granted. 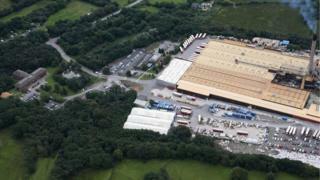 A production line at Rockwool Ltd, in Pencoed, was mothballed in 2008 when demand dropped due to the recession. But it said there had been "increasing demand of non-combustible insulation products" in the UK and Europe. Residents raised concerns but Bridgend council planners approved the scheme. Rockwool will build a new storage unit for production off Wern Tarw Road, with a conveyer belt taking the products to its factory nearby. The company, which makes insulation which can be used in cladding, employs 400 people at its factory and hopes the multi-million pound expansion will create 65 new full-time jobs. It will include the re-opening of the mothballed production line. A number of residents objected to the plans with concerns about wildlife, including dormice, bats and badgers, traffic and air pollution. In the application, Rockwool said it would introduce mitigation measures, including building a dormouse crossing to address concerns. Nine councillors voted in favour of the plans with four against.